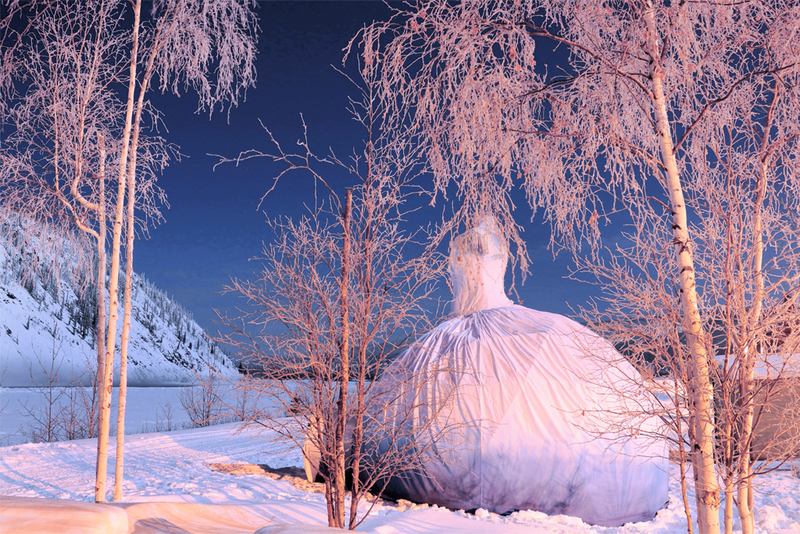 The Yukon Bride - The project was first developed during an art residency in Dawson City, YK. Installed on the banks of the Yukon River. 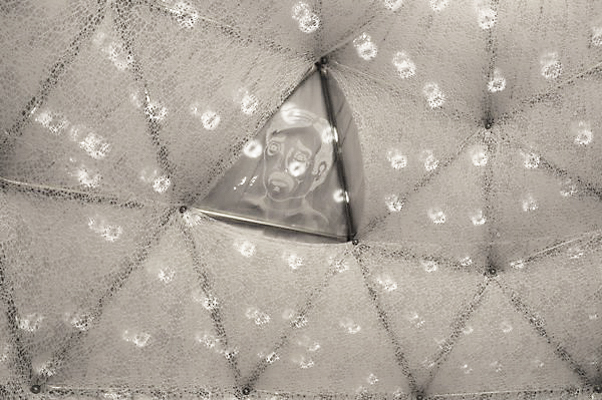 Wedding Dress - The basic structure is comprised of a metal geodesic dome topped by a torso shape. 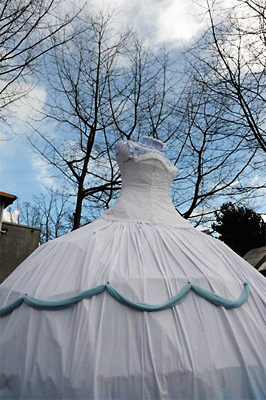 The False Creek Bride - The story incorporates the site's closest body of water at each telling. 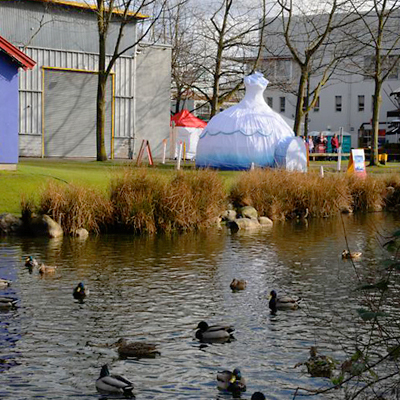 Seen here on the shores of False Creek in Vancouver during the 2010 Winter Olympic celebrations. 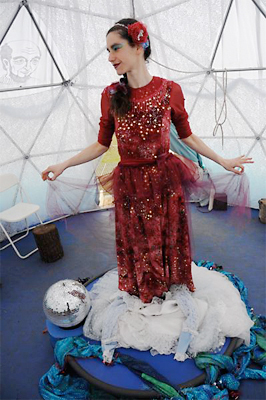 Entrance - The storyteller, Naomi Steinberg, makes a dramatic entrance once the audience is seated. She appears suddenly rappelling from a rope. 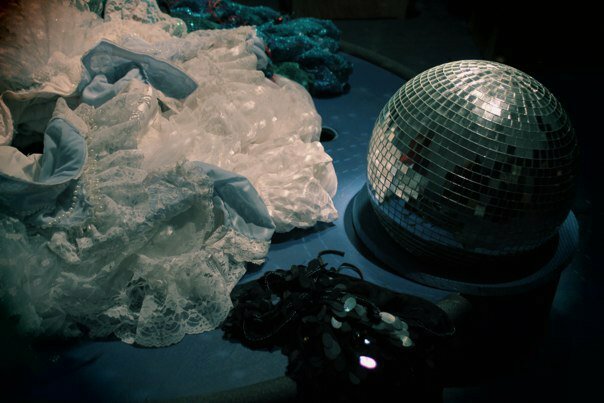 Lace Netting - Through storytelling the audience is guided on the mythical journey of Serena, a magical fish caught in a fisher’s net who bargains for her life by promising to transform into a bride and to catch fish with the lace and netting of her dress. Incantation - The premise of the story is based on traditonal Celtic Silkie and the Inuit Sedna folktales and is given a contemporary twist as the fisher struggles with the communities need for his fish harvest. 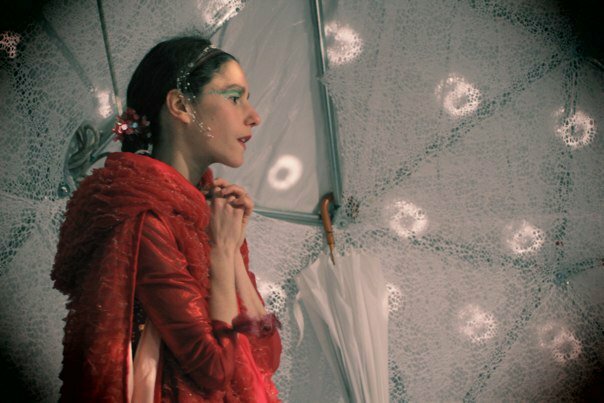 Red Fish - The storyteller reveals the stages of the character's transformation through layers of costumes. 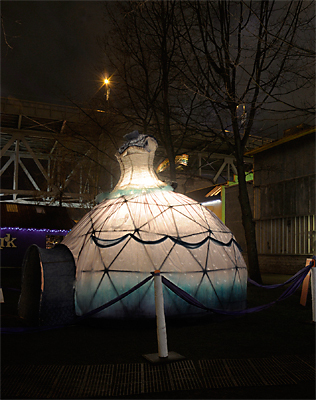 Dress Illuminated - The outer fabric of the structure glows at night when illuminated from the inside. Lighting Effect - Evening performances include a special lighting effect on the interior lace wall. 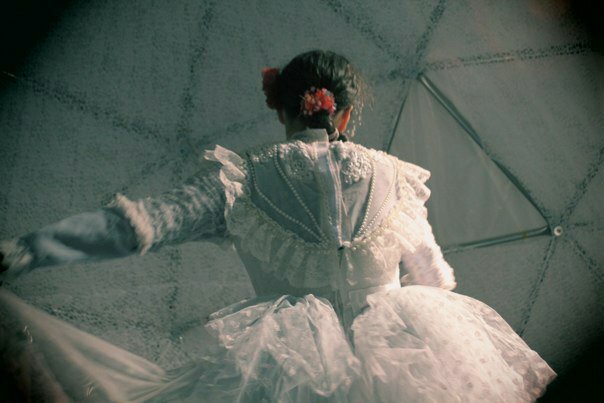 Bride Night - Nighttime performances have a chimerical quality to them beautifully portrayed in Xandra Greyson's photographs. Exit - Serena returns to the watery depths, only to return once the fish are abundant again. Photo by Xandra Greyson. Fin - Photo by Xandra Greyson. 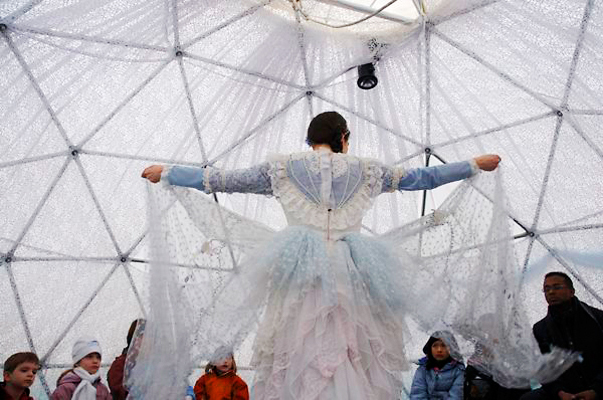 The False Creek Bride was a multi-disciplinary performance inside a domed structure resembling a large white dress during the 2010 winter Olympics in Vancouver. 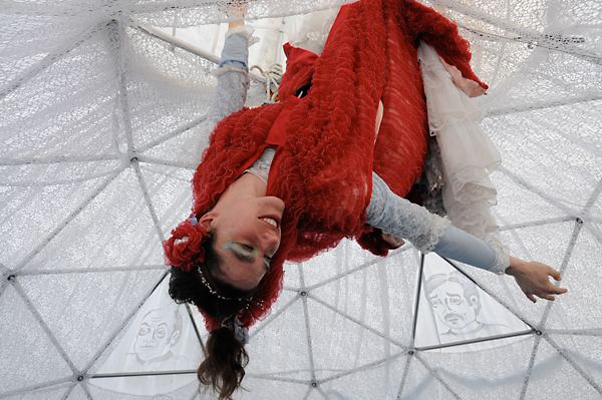 The audience was guided on a mythical journey through the story of Serena, a magical fish captured in a fisherman’s net. She must bargain for her life by promising to marry the fisher and supply him with her bounty from the sea. The premise of the story is based on traditional Celtic Silkie and the Inuit Sedna folktales and is given a contemporary twist as the fisher struggles with the communities need for his fish harvest. 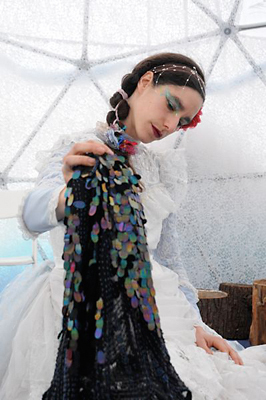 The story was first developed during my art residency in the Yukon.